A Managerial Accounting Project: Gatsby Manufacturing, Inc. I started my auditing internship in a Big Four firm last week and wanted to thank you for how well you prepared me during your class. We had national training in Atlanta at the beginning of January and I was one of the most prepared thanks to the Valley Publishing Company case. Simply having seen the workpapers and heard the terminology put me a step above the majority of the other interns. The first 5 months in NY with PwC has certainly been an experience. You can let your students know I actually felt more prepared to start work than most of the other people in my training group because everything felt like a review of the material we covered in the audit practice case in your class. As a student without real–world experience, it is difficult to predict what a day is like in the shoes of an auditor, but having a tool that simulates the experience is the next best thing. The Valley Publishing Company Case provides a realistic portrait of what a staff auditor may see on the job. I recently started a job at a small public accounting firm, and the audit case, with regard to work load and difficulty, is incredibly similar to many of the jobs I work on now. I highly recommend audit professors to use this practice set with their students and help prepare them for what they will see on the job. It is a comprehensive and practical learning tool, which provides a learning opportunity that all audit classrooms should experience. I took your advanced auditing course in the fall and I passed the auditing section of the CPA exam last month. The questions on the exam were very familiar to me since they are all related to the (Valley Publishing Company) audit practice case we used in class. When I completed the simulations, I recalled completing the short case assignments with my group partners and your detailed explanation on those assignments, which really helped me a lot in answering those questions. A simulated audit of a small town newspaper publishing company designed to illustrate the principles of audit field work and basic workpaper preparation. The focus is on documentation for the achievement of audit objectives and on communication of findings. Improved grading templates and clarity throughout. Updates to student modules and instructor resources for the most recent accounting and auditing standards. Revised templates assist students in difficult areas. The Case can be used to supplement textbook materials in an introductory auditing course. It also provides for a rigorous fast-paced experience in an advanced course where basic audit techniques are reinforced. The Case has been proven effective as the centerpiece of an advanced auditing course. Case modules help students to better understand how audit procedures are employed in an effective and efficient manner. Assignment modules can be done individually or in total to include preparation of the audit opinion and financial statements. Instructor materials provide detail guidance with suggestions about options for using the Case and a grading template. Completing the Case in a team setting provides the most realistic experience. The Case includes an initial assignment to help students gain an understanding of the “client” business and to identify important transactions. The assignment includes a review of minutes of board of director meetings and an assessment of internal controls, with optional steps to document procedures and controls with flowcharts. Widespread use of analytical review procedures throughout the case, which helps students learn audit efficiency, along with effectiveness techniques. Interesting and challenging optional assignments are included to identify fraud and support a fire loss claim to an insurance company. Assignments cover all major financial statement areas. Assignments include “work–done” memos to enhance communication skills. Includes an optional final assignment to prepare the audit opinion and financial statements, including footnote disclosures and a statement of cash flows. Prior year workpapers are included as a guide, but are not to be followed blindly. Students are encouraged to develop recommendations for a management letter. Section 1—A case narrative with instructions for each of 11 assignment modules. Section 2—The auditor′s Permanent File to include system narratives, flowcharts and minutes of the board of directors meetings. Section 3—A completed set of workpapers for the prior year, including financial statements. These are used as reference material to guide the current year audit, but the current year has some unusual transactions not encountered before. Section 4—Paper documents for use in the current year, such as confirmations and correspondence. 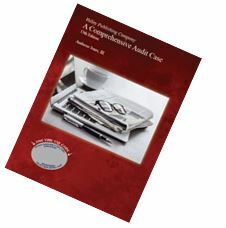 The instructor manual largely resembles a completed set of audit workpapers, including financial statements. The manual also includes guidance on administering the case and very detail grading templates for each assignment module. Suggestions are included for those wishing to skip some of the assignment modules. 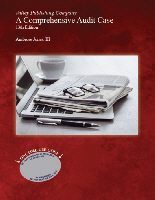 Armond Dalton publishes only the highest quality accounting and information systems supplements. Each is backed by extensive university teaching experience and excellent teacher and textbook author reputations. All books, including revisions, have been extensively student tested either in classrooms or by multiple students outside of the classroom, with the focus being making the materials easy to understand. Because of our concern for students′ needs and the high price of textbooks, we offer significant cost savings for high quality materials by eliminating the use of a sales force. The hallmark of our company is the service we provide. Our office staff knows every aspect of our business and is committed to quality service. Phone calls are answered by friendly, knowledgeable personnel and in–stock orders are shipped within 24 hours.